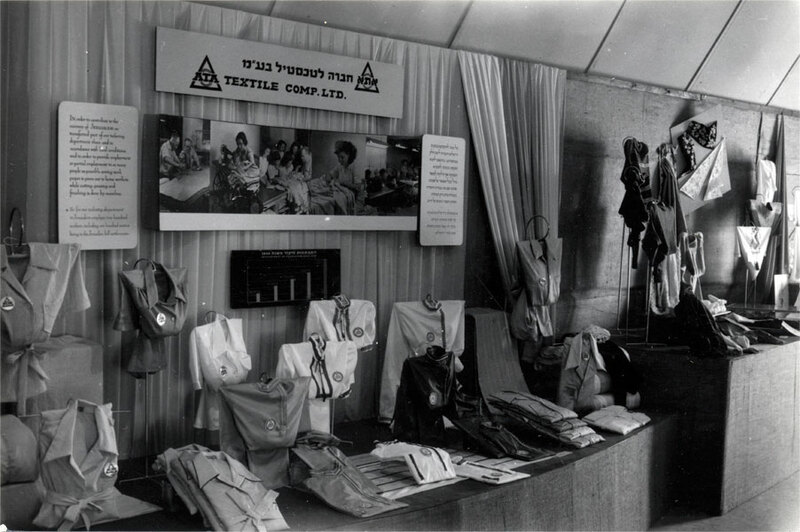 Trade exhibition in Jerusalem 1950. Black and white photo. The sign says: In order to contribute to the recovery of Jerusalem, we transferred part of our tailoring department there, and in accordance with local conditions, and in order to provide employment or partial employment to as many people as possible, sewing work proper is given out to home workers while cutting, pressing and finishing is done by ourselves. So far our tailoring department in Jerusalem employs two hundred workers, including one hundred women living in the Jerusalem hill settlements.